I need to stop and smell the flowers. I need to do nothing and think of nothing for the next hour. When I am frazzled and stressed, I grab our jar of dried chamomile flowers and and make myself a good cup of chamomile tea. Then I take it to bed with me and close myself away from the outside noises for an hour. That's what I need sometimes to get a grip of myself and for my brain and body to reach the right balance again. 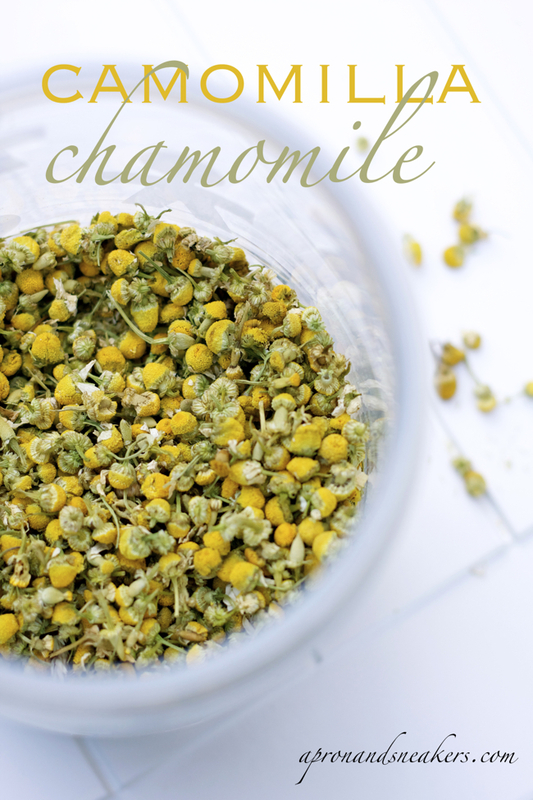 Chamomile has this power to relax especially when taken at the end of a long day. Next to milk (and water), this is the drink that Italian babies are advised to drink from birth to aid them in sleeping. I never left home without it when my kids were still babies. Chamomile bags were in my pack of essentials. I take this habit until now. Our house is never empty of chamomile. I cannot hide the fact that I have been into smoothies lately. This is already my third smoothie post and there's a promise of a couple more to come. There are new fruits ready to be liquefied in the blender for other kinds of smoothies. Later. I think this is my favorite smoothie among the ones I have done. Even my husband agrees too. 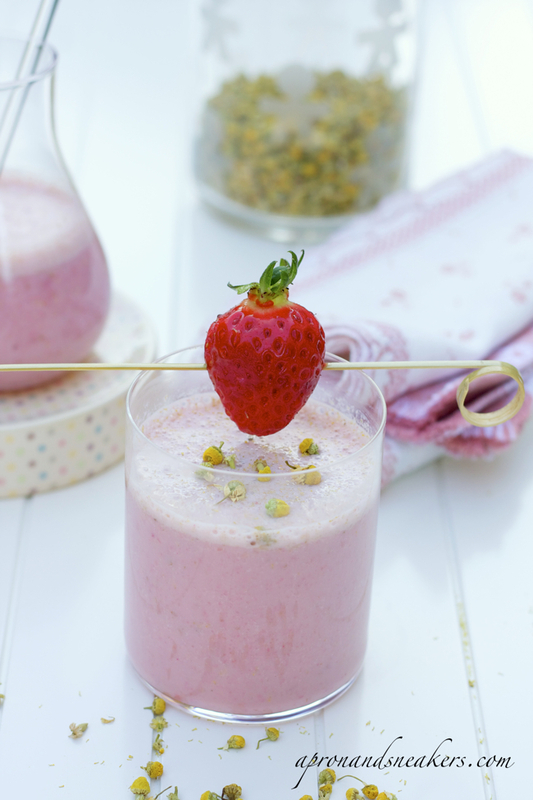 There is a surprising beautiful blending between the strawberries and chamomile. Both are subtle and not intrusive, that when mixed together, they created a commingling faint hint of berries and flowers. Just the color itself makes you relax. 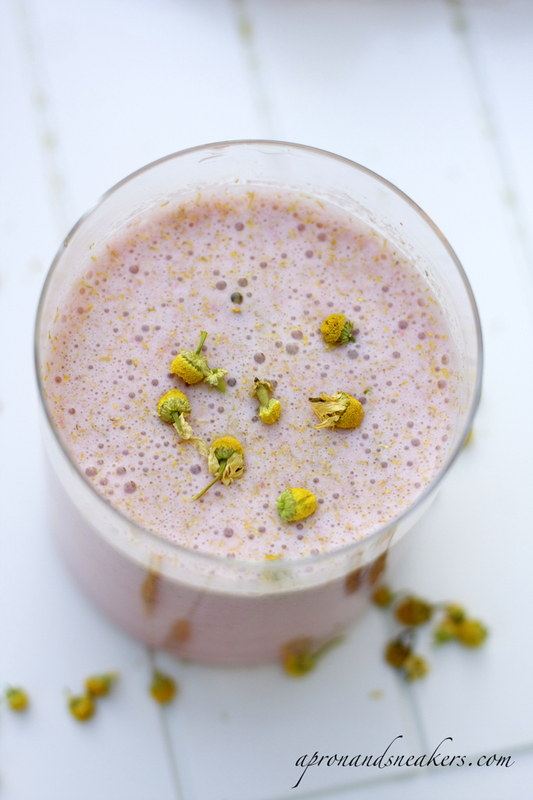 I included the dried chamomile flowers in my smoothie because its floral hint was a tad stronger and I like my smoothies with a bit of texture. 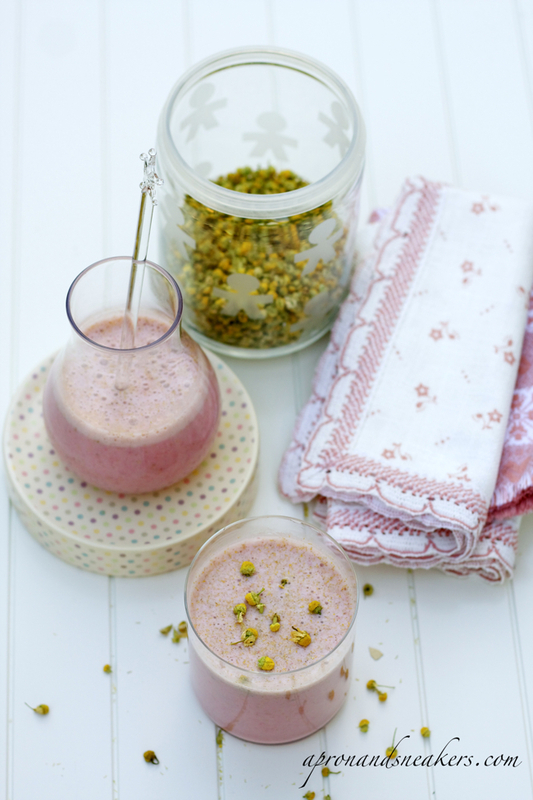 The quinoa gave the body to the drink and the taste just hid under the berry and floral flavors. Quinoa contains essential amino acids like lysine and quantities of calcium, phosphorus, and iron. If you have some leftover cooked quinoa (without condiments of course) in the fridge, use it in your smoothie like what I did. Otherwise, I would have used an easier option, the oats. I hope you enjoy this relaxing and healthy breakfast (I also drank it in the afternoon) drink. It's delicious, I'm telling you. Steep chamomile flowers in hot water for about 5 minutes. Strain flowers if you don't want to include them in the smoothie. If you want to include them for a more intense flavor, just leave them. Remove teabag if using one. Refrigerate until it cools down. 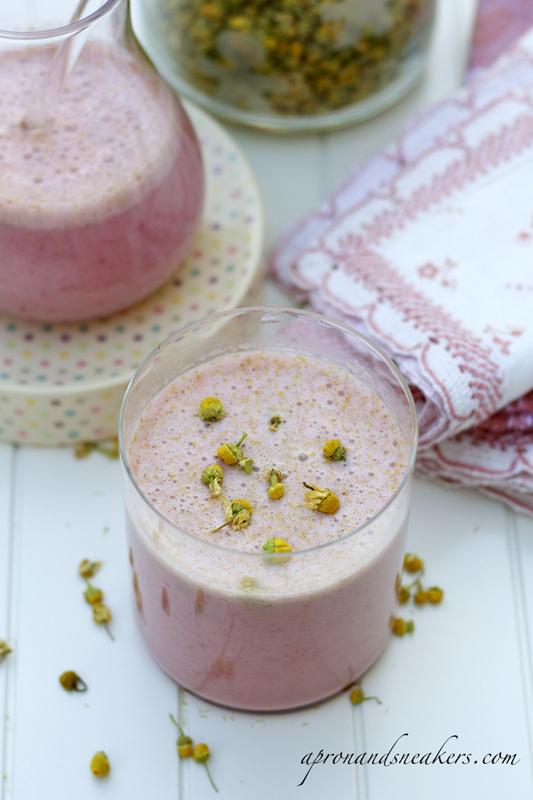 Put the almond milk, cold chamomile tea (with flowers), cooked quinoa & strawberries in a blender and blend until smooth. Sweeten with honey if needed. Garnish with dried chamomile flowers if desired. Note: If using oats instead of quinoa, grind them to an almost powdery consistency in the blender before adding the other ingredients.